Everyone loves a roast dinner so why do we always save it just for Sundays? Probably because we're under the impression that it takes a long time to cook, needs numerous accompaniments and is way too expensive for a midweek meal. Let me introduce you to my new friend the Mini Roast which blows all of these preconceptions out of the water. 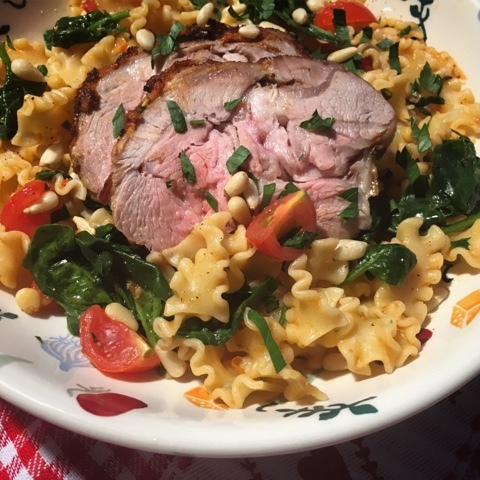 I'll fully admit that I had them too but the recipe I'm sharing today made a perfect midweek meal combining roast lamb with pasta. Not something I'd have ever have thought of doing but it worked amazingly well. I also enjoyed my first ever taste of red pesto having only ever had the traditional green up until now. My culinary horizons know no bounds! So what exactly is a Mini Roast? Basically it’s a smaller, cheaper roasting joint. You won't find them branded as such in the supermarket but as a guide you're looking for something weighing in at around the 400-500g mark. Ask your butcher to cut a piece of beef or lamb to size for you, look on the shelves for a smaller cut or buy a larger piece and split it into half for now and pop the other half in the freezer. 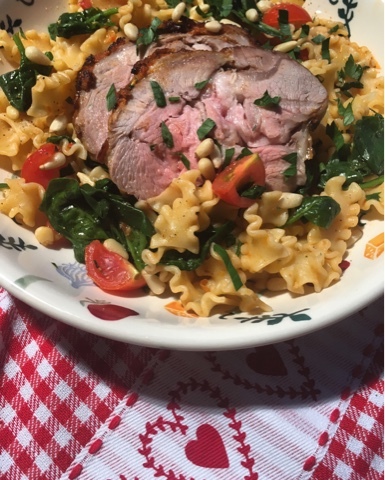 The recipe's that have been put together by Simply Beef & Lamb serve 2-3 people. 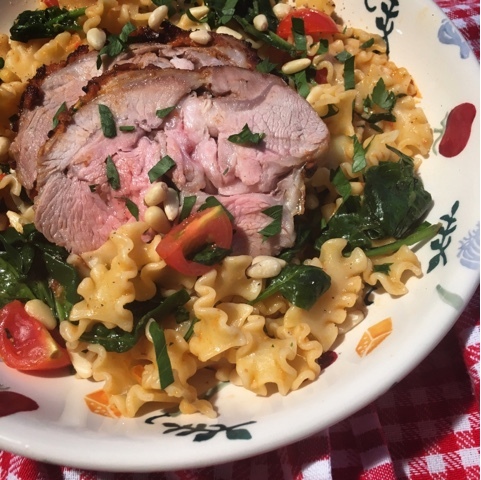 Three of us enjoyed our Lamb Mini Roast with Red Pesto but it could easily have been eked out to serve 4 by making more of the pasta side dish. Oh so tasty, economical and surprisingly quick to cook. Only a couple of minutes of hands on prep time at the start to baste the mini roast with the pesto before popping in in the oven. Once its cooked and resting the accompanying pasta takes barely 15 minutes to prep and cook and the full dish is on the table well within an hour. One thing to keep an eye out for when choosing your meat – whether its beef or lamb – is a quality mark like the Red Tractor logo. It means the meat is farm assured and is of top quality. Producers can only display this badge when they meet strict food safety and animal welfare standards so you can buy with confidence and a clear conscience. When you've gone to the effort to ensure that the meat you are eating is of the highest standard you then want to make sure that you cook it to perfection for the full farm to fork quality experience. If time allows take the joint out of the fridge and allow it to come up to room temperature before you begin. We all like our meat cooked differently and the best way to ensure that your mini roast is cooked to your particular preference whether that be rare, medium or well done is to use a meat thermometer. Again if time allows try to allow your joint to rest for a minimum of 10 minutes, ideally 20. Cover it will foil and keep it warm. This helps the fibres to relax which makes carving easier and each mouthful more tender and juicy. If you're inspired to try out some more midweek meals with Mini Roasts head on over to Simply Beef & Lamb where there are lots more easy recipes and short and simple videos. Why save it for Sunday? Transfer to a metal rack in a roasting tin and roast and roast for 35-40 minutes. Cover with foil if browning too quickly. Meanwhile, cook the pasta according to the packet instructions, drain and return the pasta to the pan. Add the remaining pasta ingredients and warm through. 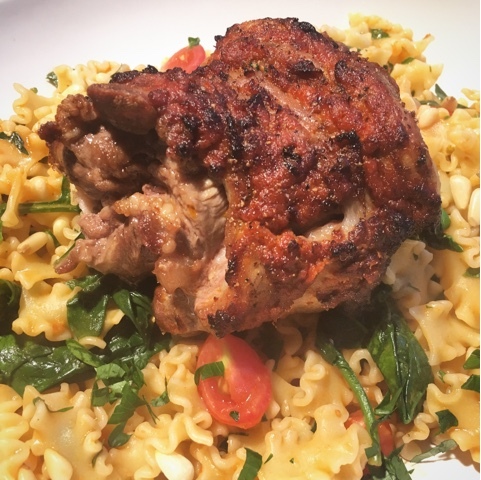 Thinly slice the lamb, and serve with the pasta. Disclosure : This is a commissioned post for Simply Beef & Lamb. As always, all views expressed are my own. I have never heard of a mimi roast...but we totally love lamb. This looks like a delicious meal that would make great leftovers too. Perfect for the winter months we are just getting into. Since theirs only two of us in our household - you had me at Mini Roast! This looks delicious! Looks delicious, I love lamb. I'm going to have to give this a try. What do you know, I just had roast beef for lunch! It was leftovers from the weekend but still...lol! This looks amazing. And since there's just 2 of us at home, perfect serving size! I was just talking to a friend about making lamb for once. I love it but I've never tried cooking it. Yours look amazing! 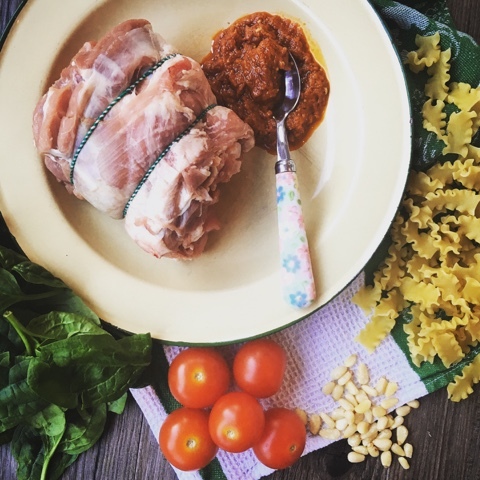 Lamb and pesto isn't a combination that I have thought of before, but it sounds delicious. It looks cry comforting too. 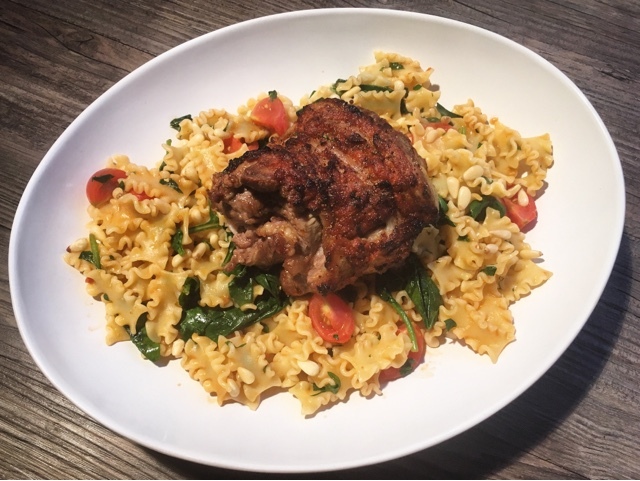 I don't associate lamb with pasta but when I think about it lamb roast with orzo is a very popular roast in Greece. This looks delicious and filling - perfect family fare.